As landfills are closed and new and stricter legislation enacted, the problems of waste and pollution grow ever larger. Re-engineering production lines to reduce the source of unusable by-products is one answer, and developing new technologies to make use of these materials another. Recycling provides an immediate solution, and it is one that is becoming more and more popular in a variety of industries ranging from styrene to steel to newsprint. 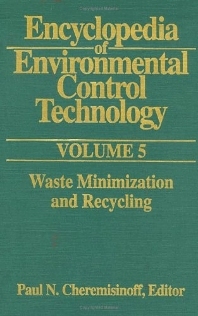 Like the other titles in the "Encyclopedia of Environmental Control Technology" series, this volume draws on contributors from around the world who are engaged in finding ways to solve the problems of waste and devising new strategies for recycling. The late Paul N. Cheremisinoff, P.E., was a professor of civil and environmental engineering at the New Jersey Institute of Technology. Professor Cheremisinoff had more than 40 years of experience in research, design, and consulting for a wide range of government and industrial organizations. He was author and co-author of numerous papers and books on energy, resources, and the environment, and was a licensed professional engineer. He was a member of Sigma Xi and Tau Beta Pi, and a Diplomate of the American Academy of Environmental Engineers.